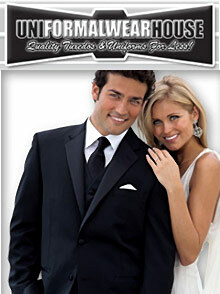 Uniformalwearhouse is the place to buy men's tuxedos for all occasions. From a simple cut to a classic tuxedo with tails, they have the right formalwear for every event. Free Shipping will be applied automatically at checkout on the Uniformalwearhouse website. Wedding tuxedos - A tuxedo is the standard in men's wedding attire. Buy one of their fine men's tuxedos to celebrate your special day. Choose designer wedding tuxedos by Calvin Klein, Ralph Lauren, Geoffrey Beene or other top designers and you'll always have the right clothing for any black tie event without the hassle of renting. Prom tuxedos - You can buy your prom tuxedo from the Uniformalwearhouse for less than you think. Owning your own tux can save you money when college formals or friend's formal weddings require black tie dress. And their selection of prom tuxedos is both affordable and great looking. Tuxedo accessories - Complete your formalwear look with everything form bow ties and cummerbunds to dress shoes and formal wear jewelry. Men's formalwear hats - Add the finishing touch to your tux with a fine men's hat. Choose fedoras or derby hats, or a classic top hat for the ultimate look in men's formal attire. Tuxedos for work - If your employment calls for a men's or women's tuxedo suit, Uniformalwearhouse has quality affordable tuxes - ideal for fine restaurant waiters and hotel front desk positions where a formal look is required. If you're wondering what to wear to a formal wedding, Uniformalwearhouse has the answer. Browse their site for the finest looks in men's evening wear. Whether you want to buy designer men's tuxedos or choose inexpensive prom tuxes, you'll be assured of the best quality with the best prices at Uniformalwearhouse.